The best compost heaps contain a wide variety of different materials, in fairly thin layers. I never add pernicious weeds. Heaps should be neither mushy nor bone dry. Use plenty of cardboard, torn or shredded, and scrunched paper. (It’s easier to tear cardboard which has been left out in the rain!). The easiest and best compost activator is urine. Dilute 50:50 before watering on. 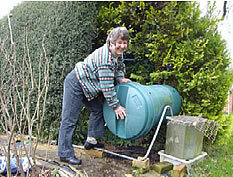 ^ Heaps of Fun - Sue demonstrates the tumbling compost bin and how to layer material in the wooden bin. 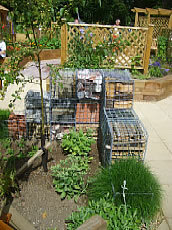 ^ Take it as red, The right hand grow bag contains the plants sown at the ‘right time’. 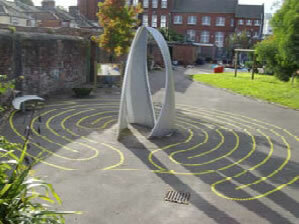 Twists and Turns As part of the ‘Walk A Quiet Path’ project across Southampton in 2008, the Ropewalk Community Garden commissioned a rope-themed labyrinth in the autumn to encircle a metal feature in the middle of the play area. The Ropewalk Labyrinth is a unique adaptation of the traditional seven-circuit Cretan labyrinth and weaves its way around a number of fixed features at the site, including a metal seat, drain and three metal fins. Dee Brown from the Ropewalk Community Garden and Claire Townend from the Environment Centre and local young people helped to stencil the feature on the ground. 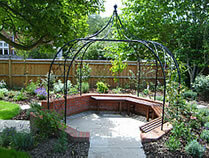 It was completed in time for the annual Fun Day event and will be a permanent feature in the garden. design was specially adapted to wrap around the features in the site. The end of November can be a difficult time to get right when it comes to planting design: a little too early for the winter-flowering shrubs and bulbs and a little late for the late summer flowering annuals, climbers and shrubs. The 9 examples below were photographed in my garden at the end of November and show that with a combination of luck, an autumn mild spell and a sheltered aspect, there can still be plenty of colour to brighten the mood at this time of year. 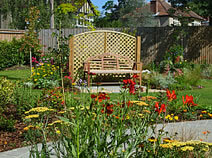 Many congratulations to design and gardening clients, the Smith family in Bassett, for their Highly Commended award in the Best Private Garden – first time entry section of the 2008 Southampton in Bloom competition.